These triple brushed dog flannel sheets are almost as soft and as cute as your actual pup! 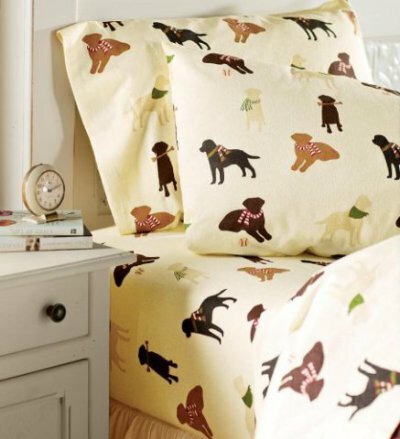 They are covered with adorable chocolate, black, and yellow Labrador retrievers with a few golden retrievers sprinkled in for good measure. Each of the many labs is wearing a cute festive scarf. These high-quality sheets come in all standard sizes, are 100% cotton, and are pill and shrink resistant. For more information about the triple-brushed Labrador flannel sheets, click here.